In the music world we have doublers, instrumentalists who play two or more instruments on a high level. Almost always the doubling is compatible—clarinet and sax, violin and viola, that sort of thing. The most unusual doubler I ever met was a bassoonist: we were performing the Schubert Octet together. During a break he received a call and accepted a wedding job on harp! A bassoon-harp doubler, wonderful. As far as I know I am the only cellist-playwright doubler. I know of one banjoist-playwright doubler—Steve Martin. Johannes Brahms called his doubling, pianist and composer, the amphibian life—life on water and land. To date, my doubling seems mostly natural, each discipline supporting the other in tangible and intangible ways. That’s a good thing. I’ve told you the important stuff. If you desire the official record please click on the link below and there you’ll find lots of factoids but no social security or pin numbers, no answers to life’s existential questions. These codes are available only upon request. HARRY CLARK has re-conceived and re-positioned the way and means of classical music presentation with some fifty groundbreaking works for the stage. “An extraordinary interweaving of music and biography” (Hartford Courant); “A program that’s both inviting and exhilarating” (Arizona Daily Star); “An absorbing evening of music and theater, cleverly interwoven (Chicago Tribune, Ravinia Festival); testaments to the fresh and novel ways that his programs garner critical attention and ignite imaginations of audiences coast-to-coast. 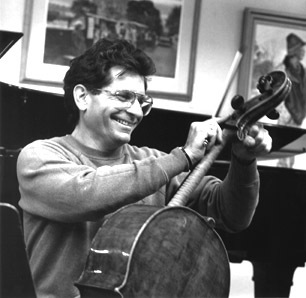 Clark’s pathway to these singular concert-dramas begins with the cello, a childhood passion, next, making music with his partner, pianist-wife Sanda Schuldmann, and, finally, with the Duo’s creation of Chamber Music PLUS, one of America’s most innovative producing companies. Commissioning and premiering dozens of composers, searching out neglected works of the past with a special emphasis on women’s often unheralded contributions, Chamber Music PLUS’ mission is that added ‘plus’, music and exploration of the animating spark of all inspired endeavor. Clark’s concert dramas are continuations of this need to understand the whys and the hows of creative enterprise and his desire to impart these stories – funny, poignant, heartbreaking, heartwarming ones, in the composer’s music and words. The result, fully realized theatrical events with simplest means – a few fine musicians, a wonderful actor or two. Harry has the great fortune and pleasure to work with a ‘who’s who’ of wonderful actors of film, television and stage including such luminaries as Theodore Bikel, Edward Herrmann, Barbara Feldon, Mason Adams, Philip Bosco, Sandy Duncan, Jessica Walter, Ron Leibman, Sharon Gless, Jean Marsh, Kathleen Chalfant, Katherine Helmond, Stephanie and Efrem Zimbalist, Jasmine Guy, John Schuck, Robert Picardo, Armin Shimerman, Michael York, Bob Clendenin, Keir Dullea, Harvey Fierstein, Lou Gossett, Jr., Jill Claybugh, Margot Kidder, Michael Learned, Hayley Mills, Lynn Redgrave, John Rubinstein, Elke Sommer, and Richard Thomas. Recent works include: Lisztian Loves, featuring renown pianist André Watts and Michael York, premiered at the famed Ravinia Festival; and Passionately, Piazzolla!, a collaboration with Ballet Tucson, featuring actor Robert Beltran as tango legend Astor Piazzolla. Orchestras, too, appreciate the inventive productions and commissions by the Hartford Symphony (Charles Ives), and Orchestra New England (Ira Gershwin), have delighted the symphonic-going public. Clark has also turned his attention towards visual artists including Maynard Dixon and one of his most frequently performed shows, Still Life: Frida Kahlo and Georgia O’ Keeffe. A work dear to him is his collaboration with jazz composer Avery Sharpe and actor Jasmine Guy, Raisin’ Cane: A Harlem Renaissance Odyssey, touring nationally with a very special stop at The Apollo Theatre. Clark’s non-musical plays include Clouds in Heaven, The Combination, Sarabande for Ezra, and Pluto Déjà vu, the last two named both finalists at the prestigious Eugene O’Neill Theater Summer Festival. Currently, he’s completing two books, the first, Of Suites, Songs and Sonatas: Bach, Schubert, Chopin, Brahms concerns the symbiotic relationship of composers and their instrumental muses; the second, Tucson Transmorgifications, a remembrance and reconciliation of his early childhood home, Tucson. Tucson, a place he again calls home, shared this time with Sanda and their two Welsh terriers, Mic and Lola. For a video feature on Harry Clark’s play about Robert Schumann, visit: . For further information on this the works by Harry Clark, visit www.harryclark.net or contact Sanda Schuldmann at 520.437.5614 or sanda12@comcast.net.